Leading Manufacturer of electronic capsule counting and filling machine, electronic multichannel tablet counting and filling machine, tablet counting and filling machine, capsule counting and filling machine, tablet capsule counting filling machine and capsule counting & filling line from Ahmedabad. Granules in pharmaceuticals, cosmetics, foods, Ayurveda and Confectionery industries.The high-speed tablet & capsule counting and filling machine having8, 12 and 16 counting channels. Compact design with single or double conveyor can improve the capacity of output. Our machine equipped with advanced detecting system which can count and fill all standard and irregular shapes and all sizes of tablet, capsules, caplets, soft gels with 100% accuracy. Neck/mouth bottles can rapidly bottling Protect materials from harm Feeding evenly with quiver, special patent filling part, no breakage of the material. “No bottle No Count & Fill”. Anti-dust Using our own original high anti-dust sensor technology, the machine works accurately with good stability in heavy dust conditions. We are engaged in profound business of manufacturing and supplying of Electronic Multichannel Tablet Counting and Filling Machine. These machines are fabricated as per the approved industry norms, integrated with advanced working mechanism. Used to cater to the specified filling applications of the pharmaceutical industry, these machines have gained wider market acceptance. We use stainless steel square pipe frame for fabrication of filling unit and thus, assure our customers to have sturdy design. 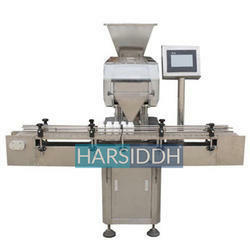 Hariddh manufacture wide range of Tablet Counting And Filling Machine based in Ahmedabad in state of Gujarat in India. The Tablet Counting And Filling Machine is capable to count and fill the variety of product like tablet, Pill, Capsules, Soft gel etc. Tablet Counting And Filling Machine is capable to deliver to production output range from 25 to 150 Bottle per minute with precise counting. Our Tablet Counting And Filling Machine is most versatile features of our offered machine is “NO Bottle – NO Count – No Fill” system. Our range of machine includes HTCF-8 Tablet Counting And Filling Machine, HTCF-12 Tablet Counting And Filling Machine, HTCF-16 Tablet Counting And Filling Machine, HTCF-24 Tablet Counting And Filling Machine, HTCF-32 Tablet Counting And Filling Machine. Hariddh manufacture wide range of Capsule Counting And Filling Machine Machine based in Ahmedabad in state of Gujarat in India. The Capsule Counting And Filling Machine Machine is capable to count and fill the variety of product like tablet, Pill, Capsules, Soft gel etc. Capsule Counting And Filling Machine Machine is capable to deliver to production output range from 25 to 150 Bottle per minute with precise counting. Our Capsule Counting And Filling Machine Machine is most versatile features of our offered machine is “NO Bottle – NO Count – No Fill” system. Our range of machine includes HTCF-8 Capsule Counting And Filling Machine Machine, HTCF-12 Capsule Counting And Filling Machine Machine, HTCF-16 Capsule Counting And Filling Machine Machine, HTCF-24 Capsule Counting And Filling Machine Machine, HTCF-32 Capsule Counting And Filling Machine Machine. Counting of manufactured products has become of primary importance in the pharmaceuticals due to the need to account for the production volumes. In this regard, Harsiddh is pleased to offer a modern state of the art tablet capsule counting and filling machines. Our product portfolio includes automatic capsule counting and filling machines, electronic tablet counting and filling machine, multichannel tablet counting machine, tablet counting and filling lines as well as tablet capsule counting and packing line. The counting is 100% accurate due to advanced sensors to detect the products even when moving at high speeds. The machine is fitted with easy to use and ergonomic HMI interface and a state of the art PLC to make control and operation easy. In addition, the control system implements “no product” “no count” as well as removing broken bottles and tablets. To minimize idle times and maximize productivity, these machines do not require a change of parts when filling different products. 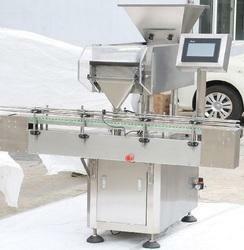 The filling machines are compact with ether single or double conveyor systems. The Delrin type conveyor is suitably designed for smooth, vibration and noise free operation. Hariddh manufacture wide range of Capsule Counting & Filling Line based in Ahmedabad in state of Gujarat in India. The Capsule Counting & Filling Line is capable to count and fill the variety of product like tablet, Pill, Capsules, Soft gel etc. Capsule Counting And Filling Machine Machine is capable to deliver to production output range from 25 to 150 Bottle per minute with precise counting. Our Capsule Counting & Filling Line is most versatile features of our offered machine is “NO Bottle – NO Count – No Fill” system. Our range of machine includes HTCF-8 Capsule Counting & Filling Line, HTCF-12 Capsule Counting & Filling Line, HTCF-16 Capsule Counting & Filling Line, HTCF-24 Capsule Counting & Filling Line, HTCF-32 Capsule Counting & Filling Line. The counting is 100% accurate due to advanced sensors to detect the products even when moving at high speeds. The machine is fitted with easy to use and ergonomic HMI interface and a state of the art PLC to make control and operation easy. In addition, the control system implement “no product” “no count” as well as removing broken bottles and tablets. Harsiddh Engineering Co. Introduced Automatic Electronic Tablet Counting and filling machine.This machines widely used for tablets, capsules (Hard & Soft gelatine), pills and most solid Granules in pharmaceuticals, cosmetics, foods, Ayurveda and Confectionery industries.The high-speed tablet & capsule counting and filling machine having 8, 12 and 16 counting channels. Tablet Capsule Counting Filling Machine Suitable For Pharmaceutical, Neutraceutical, Cosmetics Industry. Compact and Versatile easy to operate Tablet/Capsule Counting and Filling Machine. Suitable for Various types of Tablets and Capsules count and fill in to glass and pet bottles. Available model single, two, four head and we can make as per customer specific requirements. 1 H.P., 3 Phase, 4 Wire System, 50 Hertz. Ampoule gas centering during gas flushing and filling. Possibility of gas flushing before, during and after filling. “No ampoule – No filling function”. Fast change over due to extremely limited parts to be replaced. Possibility to memorize various parameters of different ampoule sizes. Machine equipped with pre-warming station.